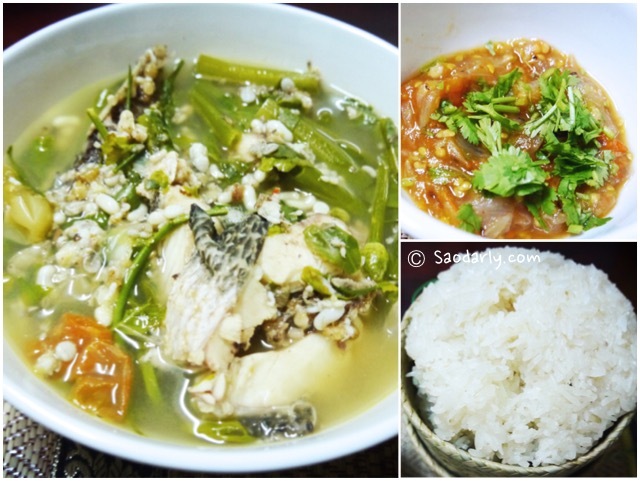 Snakehead fish and Ant egg soup (Kaeng Pa Kho Sai Khai Mod Daeng; ແກງປາຄໍ່ໃສ່ໄຂ່ມົດແດງ) for dinner in Vientiane, Laos with Spicy Tomato Chutney (Jeow Maak Len; ແຈ່ວໝາກເລັ່ນ) and steamed sticky rice. I have never eaten this type of fish soup with ant egg before. 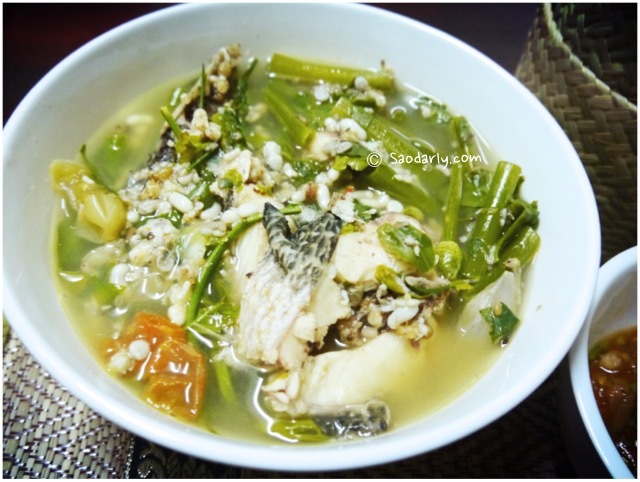 Aunt Kian loves to eat this soup as a kid living in Pakse, Laos. I went to the market with Aunt Phone and bought all the ingredients for the soup. The type of fish is snakehead (Ophicephalus striatus – Bloch) and is of great important in Laos. 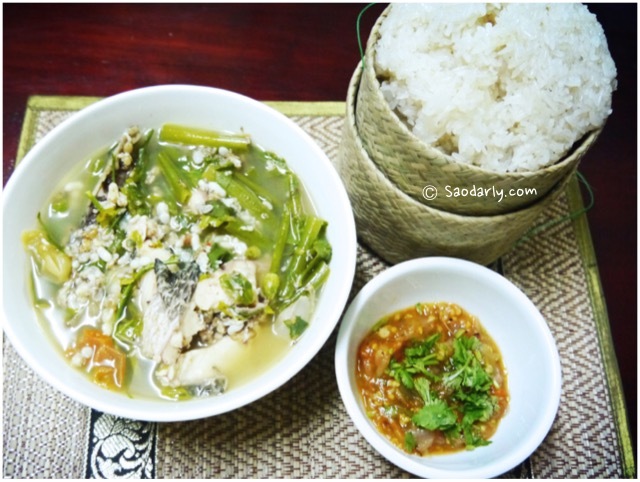 As a kid, I knew the name of two fishes and they were Pa Kho (snakhead) and Pa Douk (catfish) from catching them and eating them on a regular basis. 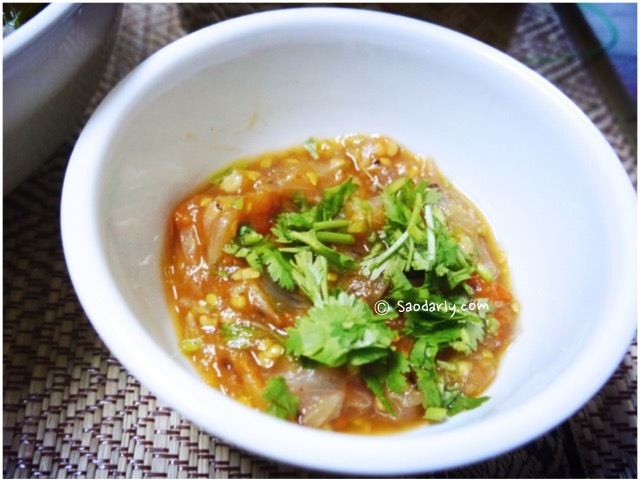 I like to eat tomato and fond of eating Spicy Tomato Chutney (Jeow Maak Len; ແຈ່ວໝາກເລັ່ນ). Aunt Kian told me “Jeow Mak Len” would make a good combination with the fish and ant egg soup. 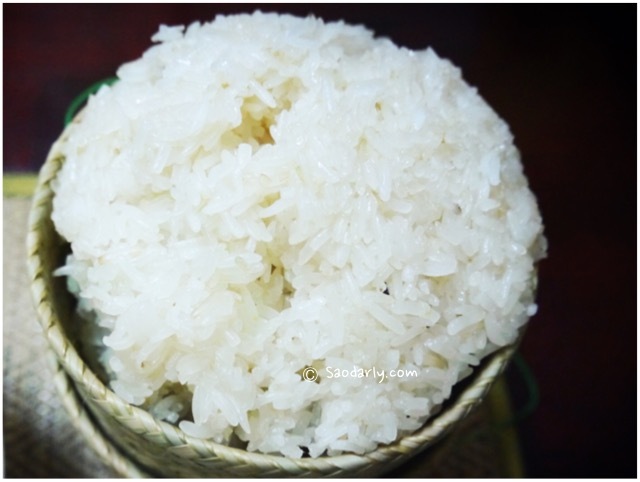 It was a delicious dinner with fresh steamed sticky rice (Khao Niao; ເຂົ້າໜຽວ)to dip in the spicy tomato chutney. I ate mostly the green onion flower and tomato in the soup and let the others enjoyed the pieces of fish and the ant eggs.